Imagine the outcry if Facebook were to change its name. People would grab their pitchforks, join a posse, and burn the Internet down. That nightmarish vision led to many sleepless nights for our team after we decided to do the unthinkable: rebrand a social network used by more than a million people a day. 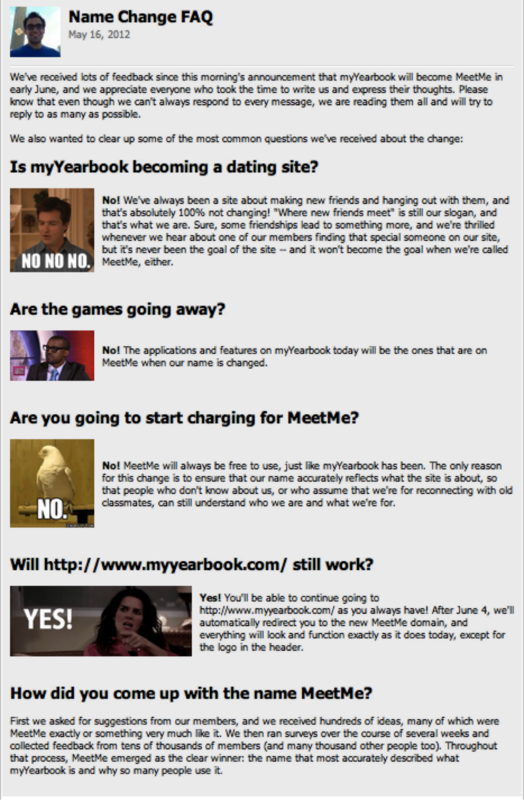 We changed the name of myYearbook, a social network for meeting new people, to MeetMe. When I started myYearbook in high school with my brothers, the name felt right. But our service and the way people used it quickly made the name obsolete, as we steadily narrowed our focus to just one thing: meeting new people. Our service had become the re-imagination of the bar, a digital coffeehouse, a social gathering place, but its name described a high school reunion. It was no surprise that we were often confused with Classmates.com by our most important audience – people who had not joined us yet. After last year’s merger with the Quepasa Corporation, we knew we had the perfect opportunity to choose a name that really fit, and in the process create a single global brand for meeting new people. After a painstaking process of ideation, internal and external surveying in multiple languages, logo development, domain name acquisition of meetme.com and meet.me, Twitter-handle acquisition of @meetme to avoid a Pot-smoking Elmo incident, securing the ticker MEET on the NYSE AMEX, and careful click-through rate experimentation — not to mention one late night at the office with a Ouija board and a rabbit’s foot — we settled on MeetMe. There was just one problem: we had no template for doing a rebrand right – just horror stories of doing it wrong. When NBCUniversal’s Sci-Fi Channel changed its name to a slang term for syphilis, it was ridiculed. When Netflix announced they were changing its DVD-by-mail service to Qwikster, public outcry and a plummeting stock price led to an abrupt change of plans. If giant billion-dollar companies consistently screw up rebrands so badly, how could we hope to get through ours unscathed – especially with a supposedly fickle social community. Yet that’s precisely what we did. Almost a month after the rebrand, the key measuring sticks we use to gauge user acquisition and engagement have all stayed steady, if not increased. We went down this path half-expecting to lose as much as double-digit percentages of our user base; instead our audience grew. So, what made this process so seamless? From the beginning, we approached the rebrand under no delusion that our members would approve of the change. What we were doing was deeply unpopular, and we knew it. That understanding colored every decision we made. Though surveys indicated our members overwhelmingly came to myYearbook to meet new people, they still very much liked the name “myYearbook” – after all, that’s the service they chose to join! Source: Member Survey. October 2011. 7692 Responses. We knew the stakes were high, but we were actually surprised that in other surveys only 17% said they would never log in again if we changed our name to MeetMe. Some might have looked at the same data and thought twice about rebranding at all, but we were ecstatic it wasn’t 80% making that claim. We presumed the vast majority of people who made such a claim would actually stick around, as their friends and community are here. We just needed to make sure we didn’t incite a riot or an outrage that would spark an exodus. Our logo and slogan were a clear nod to the current myYearbook user. We used a smiley in our new MeetMe logo because the myYearbook logo had smileys since inception in 2005, and we wanted a visual connection to the previous identity. Moreover, we chose the slogan “Where new friends meet” to be crystal clear to our users that our mission was not changing, and to avoid the possibility of dating site connotations leading to increased churn. We wanted to underline for our users that MeetMe was about having fun and meeting new people, just like myYearbook. With its multi-colored logo smiling at you in an off-kilter way and its slogan proclaiming MeetMe is “where new friends meet,” we made clear this was an evolution, not a revolution … so please don’t revolt! We communicated to members early and often. My brother Dave and I even filmed this youtube video in which we used a prop — a giant poster-sized version of the web site — where Dave rips off the myYearbook logo to reveal the MeetMe logo underneath it while saying “nothing changes but the name.” Internally, we called that video the “please don’t churn” video. We announced the coming name change a full two weeks ahead of the actual transition. People need time to get accustomed to the idea of change, and we wanted to give them that time before hitting them with the change itself. By messaging in advance, we got the most vigorous complaints and criticism out-of-the-way before anything actually changed at all. But, of course, we intended to change a lot more than the name, and we did – but we did most of it months before the rebrand, under the myYearbook name. Most significantly, we launched a soup-to-nuts redesign of the web and mobile apps and removed a dozen features that were once popular but had outlived their day and now bloated the product. We have always found it vital not to conflate multiple major changes, and that was a winning strategy this time as well. The last thing we wanted was negativity about a redesign or feature removals to confound and color perceptions about the new brand. To be sure, the reaction to those feature removals was predictably negative, but also limited in scope to the small subset of users who still enjoyed those legacy products. Had we tied those removals to the rebrand in our users’ minds, I have no doubt that the outrage would have multiplied and led to increased churn as people “blamed” the new brand for the removals. 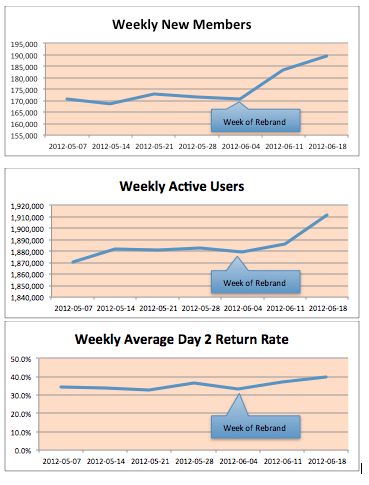 Because of our tightly controlled rollout schedule, however, it was merely a blip in user feedback for a few days. With the new design and pared-down feature set in place, we were ready to move on to the next phase of the transition. We knew it was important to familiarize members with the name “MeetMe,” even before we told them the name of the service was changing. To that end, we started with subliminal communication by launching the MeetMe Contest, which required members to submit videos in categories like Best Meeting, Meet Me, and Dying to Meet, with an iPad for the best video in each category. We messaged the MeetMe Contest all over the site in bulletins and on our home page. Over the course of the contest, our members submitted hundreds of videos, which received tens of thousands of views — and most importantly, the new name began to seep organically into the community. The now infamous Netflix video made a similar claim — that only the name on the red envelope was changing — but in reality an entirely separate login would be necessary for the DVD side of the service. That’s not keeping things the same! On the day of our rebrand, we figuratively ripped off our velcro “myYearbook” logos, and we were MeetMe. Nothing else changed because it already had. To address the most frequently asked questions, we posted a bulletin that answered them all with animated meme GIFs — an attempt to lighten the mood a bit while also reinforcing that none of our users’ worst fears would come true. Because of our measured approach to the transition, there were no significant issues to correct once MeetMe went live, but we still wanted to do something to get members feeling great about the new brand, so we launched a Youtube channel, MeetMeVideos. In less than three months, it’s already recorded over 1 million views! Our most successful video, with over 500,000 views, was this bar parody in which we imagine just how anti-social popular social sites might be if they went to hang out at the bar. It was a simple video starring and written entirely by our employees. The video reinforced again, in a light and hopefully humorous way, that MeetMe is fundamentally made of the same stuff as myYearbook always was. We are still the re-imagination of the bar, that virtual coffeehouse, but we are now MeetMe. We also produced other feel-good Youtube videos, including a MeetMe testimonials video which itself recorded over 150,000 views and consists of our users looking into their webcams and telling us the impact MeetMe has on their lives. The video was so powerful that we are talking now about making it part of our new user experience. 5. Have a good team. The coordination involved in launching a rebrand on a service with 1 million lines of code on web, mobile web, iPhone, and Android in the same week cannot be overstated. Everything could have been messaged exactly the same, but if Apple’s approval of our iPhone app took an extra two weeks, or if the web site experienced a 24-hour outage, the result could have been vastly different. At the end of the day, it came down to holding our breath, crossing our fingers, staring into the abyss, and jumping in with both feet. We relied on our talented team to execute yet again, and the team delivered.